Les jardins ont joué un rôle important dans le développement urbain de Damas et dans l’émergence d’une culture de loisir unique à la fin de la période mamelouke et au cours de la période ottomane. À cette époque, la vie sociale damascène se déroulait dans les espaces récréatifs : cantines (maqāṣif mameloukes), cafés (maqāhī ottoman), bain publics, théâtres d’ombre et fêtes de pèlerins. Cet article examine le rôle des jardins et de la campagne dans le développement urbain de Damas en s’appuyant essentiellement sur deux sources principales écrites par ʿAbd Allāh al-Badrī (894/1498) et Ibn Kannān al-Ṣāliḥī (1135/1740), choisies pour la pertinence avec laquelle elles évoquent l’histoire urbaine et culturelle de la ville. Gardens played an important role in the urban development of Damascus as well as in the appearance of a unique culture of recreation in the late Mamlūk period continuing into the Ottoman one. At this time, Damascene urban life often took place in recreational spaces: canteens (Mamlūk maqāṣif), coffeehouses (Ottoman maqāhī), public baths, shadow theatres and pilgrim feasts. This paper examines the role of gardens and the surrounding landscape in the urban development of Damascus, based primarily on two main sources written by ʿAbd Allāh al-Badrī (d. 894h/1498ce) and Ibn Kannān al-Ṣāliḥī, (d. 1135h/1740ce), chosen for their insights into urban and intellectual history of Damascus. لعبت الحدائق والبساتين دوراً هاماً في التطور العمراني لدمشق وفي بروز ثقافة فريدة لأوقات الفراغ في نهاية الحقبة المملوكية وخلال الحقبة العثمانية. في ذلك العصر، كانت الحياة الاجتماعية الدمشقية تحلّ في فضاءات النزهة: كالمطاعم أو المقاصف المملوكية والمقاهي العثمانية والحمّامات ومسارح خيال الظل والاحتفالات بالحجّاج. تدرس هذه المقالة بإمعان دور الحدائق والريف في التطور العمراني لدمشق، اعتماداً على مصدرين أساسيين، كتبهما عبد الله البدري وابن كنعان الصالحي، وقد تمّ اختيارهما بسبب ملاءمة ما يثيره هذان المصدران من التاريخ العمراني والثقافي لمدينة دمشق. Is there a quadripartite garden style in Damascus? 1Gardens played an important role in the urban development of Damascus and in the emergence of a unique culture of recreation.1 In the late Mamluk (15th century) and continuing into the Ottoman period (16th-18th centuries), Damascene urban life was manifest in many places including canteens (Mamluk maqāṣif), coffeehouses (Ottoman maqāhī), public baths, shadow theatres, and pilgrim feasts, all of which shaped Damascus’ recreational culture. During “the days of roses” (ayyām al-ward) at the beginning of spring people also strolled beyond the city walls into al-Ġūṭa, the rich agricultural land surrounding Damascus, in order to enjoy a picturesque terrain characterised by a mixture of plains, rivers and valleys bordered to the north by steep mountains. 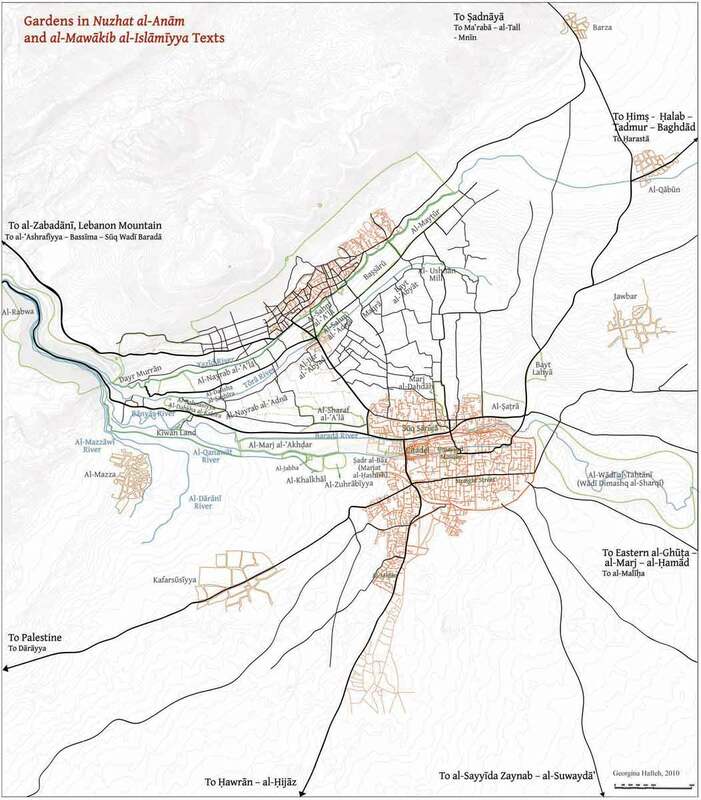 2This paper examines the role of gardens and the surrounding landscape in the urban development of Damascus, based primarily on two main sources written by ʻAbd Allāh al-Badrī (d. 894/1489) and Ibn Kannān al-Ṣāliḥī, (d. 1135/1740), chosen for their insights into urban and intellectual history, linked by the genre in which they write, maḥāsin al-Šām and their shared admiration of the city of Damascus and its beauty. 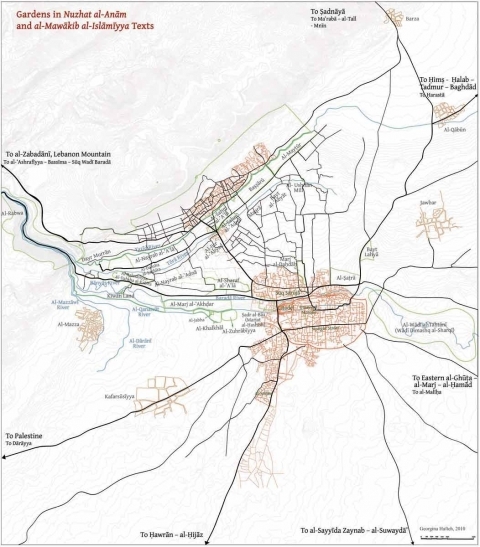 The comparisons that Ibn Kannān al-Ṣāliḥī offers are based on the earlier text of ʻAbd Allāh al-Badrī, both provide insights into the intellectual and recreational activities related to open spaces within the city of Damascus to shed light on the evolution of the Damascene urban environment. Considered together, these sources enable a partial reconstruction of the gardens that were the setting for the urban life of Damascus. 3By the time of Ibn Kannān’s account, al-Ġūṭa was increasingly developed to offer spaces for social interaction and leisure activities. However, the area set aside for recreation within al-Ġūṭa seems to have been reduced and concentrated in two suburbs: al-Ṣāliḥiyya and al-Ǧisr, with the remainder returned to agricultural purposes. This paper argues that as a result of this concentration it is possible to identify two distinct types of landscape: the natural environment of al-Ġūṭa which was increasingly used for agricultural purposes; and the urban recreational gardens (mutanazzahāt) of al-Ṣāliḥiyya and al-Ǧisr which were dominated by public facilities and developed to offer places for social interaction. Both spaces enhanced the intellectual activities associated with the Damascene urban environment and led to the emergence of a unique garden culture. 2 MacDougall & Ettinghausen 1976. 4 Ruggles 2000 et 2008. 4The garden culture of Damascus should be interpreted in the light of the broader discourse on gardens in the Islamic world and studies of the culture of recreation. Firstly, there is a significant body of scholarship that examines gardens in the Islamic world. This scholarship was primarily inspired by a collection of papers presented to the Dumbarton Oaks Trustees and edited by Elisabeth B. MacDougall and Richard Ettinghausen in 1976.2 Another ten papers were prepared for a conference on the Islamic Garden held at M.I.T and edited by Attilio Petruccioli in 1997.3 In this category one should also include the studies written by Fairchild D. Ruggles in 2000 and 2008,4 in addition to Emma Clark’s work in 2004 and another edition of Dumbarton Oaks edited by Michel Conan in 2007.5 These numerous studies offer insight into gardens from Morocco and Moorish Spain to India drawing on geographical, economic, climatic and archaeological data. However, while these publications explore important themes ranging from religious and spiritual interpretations of the paradise garden to practical studies of hydraulics and water reticulation, little attention has been paid to the use of gardens by their occupants or to Damascene gardens specifically. 6 Hamadeh 2007 et 2008. 5Secondly, a review of literature focusing on the culture of recreation in the early modern Ottoman Istanbul period shows that there is a recently burgeoning interest in Ottoman garden culture. In 2007 and 2008, Shirine Hamadeh addressed the question as to whether the landscape in 18th century Istanbul served as the site for the rise of an intellectual culture.6 Meanwhile in 2007, the coffeehouse, the rise of secular print culture, public celebration, and the use of an urban space were addressed in the series of papers exploring the cultural phenomena of the Ottoman Tulip period, which was edited by Dana Sajdi.7 One of the most recent contributions to the literature on the 18th century Istanbul garden is an article by Walter Andrews published in 2008.8 These studies have greatly enhanced our understanding of Ottoman urban space in Istanbul. The Tulip period is presented as a dynamic and vibrant era during which secular recreational activities increased in the gardens, coffeehouses, and other public spaces in Istanbul. These studies are based on chronicles, manuscripts, poetry and other 18th century texts. 9 Akkach 2007 et 2010. 7Despite the available scholarship on gardens in the Islamic world generally, and Damascene gardens in particular, several questions remain unanswered. For instance, how were the Damascene gardens and landscapes divided between natural environments and urban gardens between the late Mamlūk and the Ottoman period in Damascus? How were gardens used in the urban development of Damascus and how did this create a unique culture of recreation? What urban facilities and amenities were coupled with gardens and other open spaces? 13 Al-Badrī, Nuzha; Ibn Kannān al-Ṣāliḥī, Mawākib. 8This paper seeks to address these questions in order to shed light on this period in Damascus through a comparative study of two accounts: Nuzhat al-anām from the late Mamlūk period; and al-Mawākib al-islāmiyya from the Ottoman period.13 The latter (account) cites many descriptions of urban gardens based on Nuzhat al-anām two hundered years earlier, allowing us to compare the breadth of this period of interest in the context of urban development by using the genre of maḥāsin al-Šām (the beauties of Damascus). This comparison allows us to present a starting point to better understand Damascus’ unique culture of entertainment as it was manifest in the gardens within and beyond the city walls. 9In the accounts of Ibn Kannān and al-Badrī, Damascene recreational gathering and picnics occurred in a specific natural or urban landscape which was identified by different Arabic terms: bustān, ḥadīqa, rawḍa, ǧunayna and muntazah or mutanazzah. A brief clarification of these terms from various Arabic dictionaries is necessary before the main argument commences. According to the lexicographer Ibn Manẓūr and al-Farāhīdī,14 the original meanings of ḥadīqā, bustān, rawḍa and ǧunayna are similar with minor differences. 15 Ibn Manẓūr, Līsān, the root ḥadaq. 16 Al-Zubaydī, Tāǧ, I; Ibn Manẓūr, Līsān, the root basta. 17 Al-Zubaydī, Tāǧ, XVIII; Ibn Manẓūr, Līsān, the root rawḍ. 18 Ibn Manẓūr, Līsān, the root ǧanan; Law-Court Records, Damascus, vol. 88, document no153. 21 Al-Zubaydī, Tāǧ, XXXVI ; Ibn Manẓūr, Līsān, the root nazah. 22 Ibn Manẓūr, Līsān, the root nazah. 11On the other hand, the term mutanazzah (pl. mutanazzahāt) comes from the root nazah and the verb tanazzah. Tanazzah originally refers to a person who went by himself to a place with no water or grass, like a desert.21 However, as Ibn Manẓūr said that “the public commonly used these words incorrectly: they use tanazzah when they go on a picnic to basātīn and riyāḍ,”22 and this meaning was and still is used among Damascene people. Subsequently, from this review of different Arabic terms, here in the text the use of the word garden covers the meaning of the words bustān, ḥadīqā, rawḍa and ǧunayna. The term mutanazzah refers to the recreational garden equipped with a variety of urban and commercial enterprises where the people of Damascus gathered for leisure, entertainment and social interaction. 23 Burns 2005, p. xvii-xviii. 12To understand the role of gardens in the urban transformation of Damascus it is necessary to begin with a short description of the local geography including the Baradā River which, as the historian Ross Burns states, “If there were no Baradā River, there could be no Damascus.”23 The Baradā River rises from the eastern Anti-Lebanon Mountain at the height of 1100m, in al-Zabadānī plain, then narrows to descend steeply with the river southward which approximately doubles its volume at al-Fīǧa Spring. 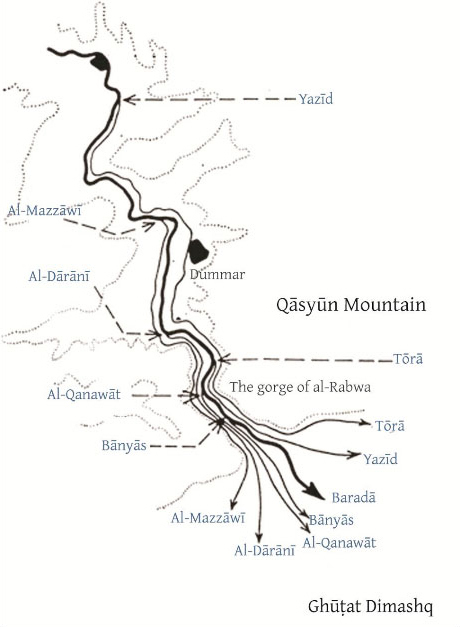 The river continues in a narrow gorge named al-Rabwa valley, where its waters spread out fan-like and divide into six branches: Yazīd and Ṯawrā in the north, are responsible for irrigating al-Ṣāliḥiyya; Baradā, Bānyās and al-Qanawāt in the south, provide water for Kīwān land, the Old City, then the eastern land outside of the walled city (al-Marǧ land); the last two branches are al-Mazzāwī and al-Dārānī, which flow into al-Mazza and Dārayyā villages in the south. After the river divides, it flows southward through Damascus to end in al-ʿUtayba Lake24 (fig. 1-2). 25 Ibn Kannān, Yawmiyyāt, I, p. 340. 27 Kurd ʻalī 1949, p. 16-17 ; Reilly 1990, p. 91. 28 Kurd ʿalī 1949, p. 18. 30 Ḫayr 1982, p. 128 ; Bianquis et alii 2010. 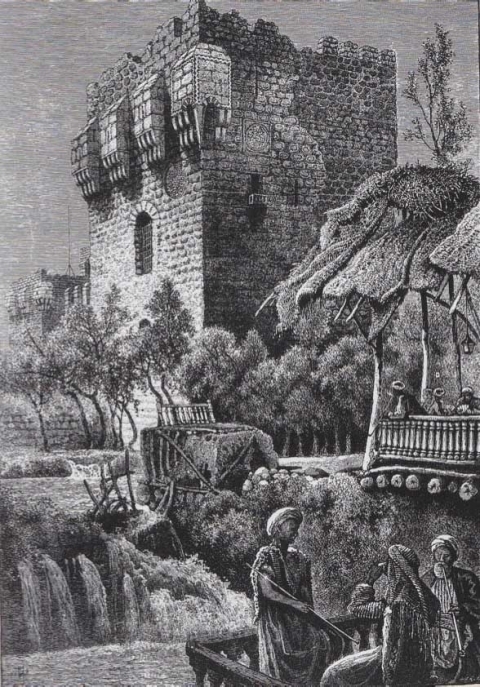 16Pictorial representations of Damascus’ landscape were not famous among Arab historians during the Mamluk and the Ottoman periods. The social life of the city as well as the natural environment tended to be represented through poetry, chronicles, diaries and other texts. This period (Mamluk and the Ottoman) of historiography was enhanced in the 19th century by European travelers visiting Damascus, whose sketches depicted lively impressions of many geographical sites, some of which illustrated people strolling, smoking, chatting, drinking coffee, singing and entertaining in the recreational gardens (mutanazzahāt).33 Moreover, travelers’ illustrations of Damascene gardens do not tend to portray daily-urban life, and are confined to the 19th century onwards. Therefore, the main descriptions of the city’s urban life from the 15th to the 18th centuries can only be traced through the remnant accounts of historians who lived and experienced Damascus during that period. In this article, my interpretation is drawn from two main sources as a point of departure to describe and imagine the Damascene gardens and to provide a basis for further research on the topic. 34 See Al-Saḫāwī, Ḍaw’, XI, p. 40; al-Ziriklī, Aʿlām, II, p. 66. 17The first is a 15th-century account from the late Mamluk period, which is an exposition of Damascus’ beauties (maḥāsin al-Šām). The author is ʻAbd Allāh Ibn Muḥammad Ibn al-Ǧamāl al-Dimašqī al-Qāhirī al-Šāfiʻī, known as al-Badrī or Abū al-Taqā (d. 894/1489), a scholar, poet and historian. Al-Badrī was born in 847/1443 in Damascus and, in his early years, he worked with his father in trade, later moving to Cairo.34 Life in Cairo made him nostalgic of Damascus, which led him to write Nuzhat al-anām fī maḥāsin al-Šām, a work of praise and admiration of the beauty of Damascus in which he described the city’s urban features, architecture, agriculture and recreational gardens (with details about flowers and other plants) as well as representing many aspects of the socio-cultural activities associated with these places. 35 Al-Murādī, Silk, IV, p. 85. 18Years later, during the late 17th to 18th centuries, al-Badrī’s account Nuzhat al-anām gained him recognition by the scholar and intellectual sufi šayḫ Ibn Kannān al-Ṣāliḥī (d. 1135/1740), who was born in a Damascene elite family in al-Ṣāliḥiyya and grew up under the care of his father, a notable Muslim šayḫ, and other prominent šayḫ-s in Damascus.35 Like al-Badrī, he engaged with the theme of the beauties of Damascus (maḥāsin al-Šām), and wrote al-Mawākib al-islāmiyya, which is the second main source on the gardens of Damascus, on which I rely and dated from the period of the Ottoman Empire. 36 Ibn Kannān, Mawākib, I, p. 222. 19In al-Mawākib al-islāmiyya, Ibn Kannān depicted Damascus’ horticulture and the cultivation of trees and flowers. He also cited several descriptions of gardens from al-Badrī’s account in the chapter on the beauties of Damascene recreational gardens (maḥāsin Dimašq al-mutanazahiyya). 36 At the end of this chapter, he offered considerable information about gardens and landscapes in Damascus and presented the changes and alteration that took place in the gardens’ cited in al-Badrī’s account of the city in his period. 38 Ibn Manẓūr, Līsān, the root ḥusn. 39 Ibn Kannān, Mawākib, I, p. 176. 20Subsequently, both these sources enable a partial reconstruction of the gardens that were the setting for the urban life of Damascus. They both used the discourse of maḥāsin to exude admiration of the city’s beauties—including gardens, landscape, and architectural marvels in addition to the description of the flowers and their medicinal and physical benefits. 37 The word maḥāsin comes from al-ḥusn, beauty and good, and it is the opposite of ugliness.”38 Al-Maḥāsin is a writing style used by historians, scholars, and poets—who lived in or visited Damascus, experienced its beauty, strolled in its gardens and experienced moments of joy and pleasure. For example, Ibn Kannān declared that his love and attachment to Damascus motivated him to write al-Mawākib al-islāmiyya.39 In both their accounts al-Badrī and Ibn Kannān mention approximately thirty gardens, but they only give details about a limited number of them. In order to describe and create an image of the gardens’ evolution throughout the centuries, a textual analysis has been undertaken for the most famous gardens in this paper, namely al-Rabwa, Qaṭya, al-Ǧabha, al-Nayrab, and Bayn al-Nahrayn. in the gardens there are palaces for the rich. 41 Al-Badrī, Nuzha, p. 83-89. 42 Ibn Kannān, Mawākib, I, p. 301. 44 Ibn Kannān, Mawākib, I, p. 295; al-Badrī, Nuzha, p. 86. 46 Ibn Kannān, Mawākib, I, p. 307, footnote n° 2. 47 Michaud & Poujoulat 1833, p. 201-202. 49 Ibn Kannān, Mawākib, I, p. 307. 50 Ibn Kannān, Mawākib, I, p. 307. 25Compared to the description of al-Rabwa in the Mamlūk period, Ibn Kannān describes the changes that took place in the late 17th century. He recorded that the maqāʻid were destroyed in 1080/1669 and he pointed out that all buildings in al-Rabwa which dated from the Mamluk period—were neglected (ḫurriba) and vanished (zāla).51 The site was transformed into a place devoid of buildings, and “the only remnants being meadows and basātīn on the river bank, owned by people in Dummar and al-Mazza.”52 In other words, al-Rabwa was developed from an urban landscape in the Mamluk period, with gardens and public facilities, to a natural landscape without any structures. 56 Ibn Kannān, Mawākib, I, p. 229-230. 57 See for information about the emergence of coffee: Pascual 1995-96, p. 141-156. 26Ibn Kannān’s account seems to contain the only historical description of the Qaṭya garden, which played a pivotal role in the function of the canteens between the Mamlūk and the Ottoman period. Qaṭya was located near Zāwiya al-Ḥarīrī, south of al-Šaraf and east of al-Rabwā, along al-Qanawāt River and adjacent to the Baradā River. It had a small village (qaṣaba),53 with a boutique (ḥānūt pl. ḥawānīt).54 This ḥānūt had an upper floor (ṭibāq) with four rooms.55 The canteen in Qaṭya was an urban public facility which served as a space mostly for the idle/unemployed people (baṭṭālīn) to gather, spend time and relax.56 Under Ottoman rule, and after the significant introduction of coffee to Damascus in the middle of the 16th century (940/1534), canteens were turned into coffeehouses,57 which began to proliferate both inside and outside the walled city of Damascus, all along the banks of the Baradā River. 27One of the earliest descriptions of a maqhā is that by Balthasar de Monconys, a French diplomat, physician and magistrate. In his diary, written while visiting Damascus on the 13th of May 1647, he described the coffeehouses as follows: “they are all covered, with panels of glass in the middle; there is a beautiful fountain with several jets of water falling into a large square basin; all the benches are covered with rugs and there are theatres where divert drinkers are entertained by cantors and players of instruments.”58 Later, an engraving by British traveller William Henry Bartlett depicts a variety of coffeehouses on the bank of the Baradā River, opened from all sides, and populated by groups of people sitting beneath shading trellises. These roofs, which block out the sun, are built from light materials such as thatch, and are supported by slender columns of wood. It also shows people sipping coffee and smoking hookahs, whilst appreciating the breeze (fig. 5). 59 For instance: Ḥammām al-Nuzha in al-Ǧabha: al-Badrī, Nuzha, 80; Ibn Kannān, Mawākib, I, p. 227-228. 61 Al-Badrī, Nuzha, p. 86. 63 A ḫān was only mentioned in al-Ǧabha garden. See Ibn Kannān, Mawākib, I, p. 222-28. 65 Ibn Kannān, Mawākib, I, p. 254. 66 Al-Badrī, Nuzha, p. 83-89. 67 Al-Badrī, Nuzha, p. 80-81. 69 Al-Badrī, Nuzha, p. 69; Ibn Kannān, Mawākib, I, p. 244-246. 72 Ibn Kannān, Mawākib, I, p. 231. See also: Ibn Kannān, Murūǧ, p. 66. 31Another indication of the urban-natural development was the change that occurred to the recreational garden al-Nayrabayn. This was a popular Mamlūk quarter full of many elites’ and leaders’ houses, and was located east of al-Rabwa on the slope of Mount Qasiyūn.71 This suburb endured changes during the Ottoman period; some gardens with their urban facilities were neglected. Al-Zumurrud public bath and an unidentified garden were destroyed and abandoned in 1115/1703.72 On the other hand, a new construction, namely maqṣūra (pl. maqāṣīr) emerged in al-Bahnasiyya, a section of al-Nayrab, overlooking Marǧat Ǧisr Ibn Šawwāš.73 These maqāṣīr are often assumed to have been small houses for people’s recreational assembling and they were interspersed with trees, fruits, flowers and water basins.74 The existence of these small buildings in al-Nayrab contributed to the shaping of the urban fabric of the city during the Ottoman period. 75 Ibn Kannān, Mawākib, I, p. 274. 76 Ibn Kannān, Mawākib, I, p. 307. 77 Ibn Kannān, Mawākib, I, p. 289-290. 78 Ibn Kannān, Mawākib, I, p. 285. 79 Al-Munaybiʻ was irrigated by the Bānyās River and paralleled by al-Qanawāt to the south. 81 Ibn Kannān, Mawākib, I, p. 275. 32Ibn Kannān description of the recreational sites differs to that of al-Badrī. The number of agricultural gardens (natural environment) seems to have increased, whereas the urban facilities for strollers—maqāʻid for instance—which were common in the Mamluk period appeared to have reduced. Ibn Kannān recorded that open spaces (including Damascene urban public gardens and the surrounding landscape) which were accompanied by commercial and public services were reduced to only two suburbs: al-Ṣāliḥiyya and al-Ǧisr. Both were full of public recreational places, coffeehouses, palaces of recreation (quṣūr al-nuzha), mosques, religious schools and public baths during the Ottoman period. Where the remnant gardens were turned into basātīn (natural landscape), it was rare to find a “maq‘ad for strollers.”75 Furthermore, al-Rabwa recreational suburb was destroyed and turned into basatīn and meadows (murūǧ) by private owners from Dummar and al-Mazza.76 Al-Sahm, al-Mayṭūr, al-Lubbād, al-Dahša, al-Ǧabha and al-Ḫalḫāl were merely “ruins and names.”77 Al-Ṣaṭrā, as well, was a public space full of buildings (‘amā’ir), which was transformed into numerous gardens (basātīn and ḥadā’iq) “without buildings.”78 Similarly, the al-Sahm suburb transitioned from a place full of connected houses to a garden with abundant trees and fruits. Another Mamluk garden named al-Munaybi‘,79 vanished in the Ottoman period, and Ibn Kannān assumed this garden to be the same as al-Zuhrabiyya.80 Ibn Kannān added that the surrounding villages of al-Mazza, Dummar, Ḥarastā, Mnīn, and Barza became lands full of trees, plants and peach.81 That is to say, the changes not only happened in the city itself but extended to the surrounding villages. 33According to the information from Ibn Kannān, we can divide Damascene gardens in the 17th and 18th centuries into two types: the gardens which continued to serve as urban centres, these being al-Ṣāliḥiyya and al-Ǧisr (urban landscape); and the remnant gardens without buildings (‘amā’ir), which were used for agricultural purposes (natural landscape). While mostly agricultural, these remnants contained a few private gardens in al-Šarafayn and Ṣadr al-Bāz (al-Marǧa) that housed palaces (quṣūr).82 These changes reshaped the map of Damascus landscape. Furthermore, this classification was drawn from Ibn Kannān observations, but the reason for the gardens’ transformations remains relatively obscure and needs further research. 83 Hamadeh 2007, p. 287. 85 Al-Qāsimī et alii, Qāmūs, see the letter b, bustānī. 34In contrast to Damascus, 18th century Ottoman Istanbul had many royal gardens that were left to the public after the court lost interest in them. The number of public gardens in Istanbul started to increase due to a political agenda: “the state sometimes sought the opening or partial opening of an imperial garden to the public as a solution to repeated instances of public disorder.”83 In Istanbul the gardener (al-bustanǧī) was a state official, an employee responsible for the royal gardens, which involved harvesting the crops and rowing the Sultan’s imperial barge along Bosphorus River.84 Royal gardens did not exist in Damascus, where the land property varied between pious endowment (waqf), private property (milk), and state-owned land (mīrī). The gardener (al-bustānī) of private property was the owner or renter of the garden, and had the responsibility to plant and harvest the crops each year, and to exploit the profitability of garden (bustān);85 whereas, if the garden was assigned as a pious endowment, the gardener not only planted and benefitted from the land but also had to transfer a percentage of the generated income towards the waqf. 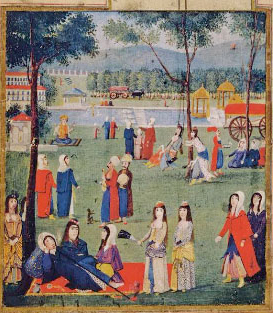 35Although transformations such as those described above occurred in many recreational gardens (muntazahāt), one might argue that the continuity of the recreational gathering during the Ottoman period might reflect a response for Damascene urban society’s demand for leisure activities. Such gatherings used to be associated with roses blossoming in spring (ayyām al-ward),86 mostly on Saturday and Tuesday. On these days, Damascene citizens of all ranks were ready to burst the boundary of the walled city and go into the vast plain of gardens. Recreational gatherings became a significant pastime due to the opportunities for entertainment and communication. Furthermore, these assembling offered an escape from the daily commitments, as well as an opportunity for the enjoyment of the natural environment. and replace abstention from love with impious recreation. behind the words of guidance, and stop listening to them. to reach it the coward and the hesitant. 90 Ibn Kannān, Mawākib, I, p. 249-253. 92 Law-Court Records, Damascus, vol. 62, document n° 114, case dated to 1141/1728. 93 D’Arvieux 1735 : II, p. 458. 96 Ibn Kannān, Yawmīyyāt, p. 367. 97 Ibn Kannān, Mawākib, I, p. 248. 98 Ibn Kannān, Yawmīyyāt, p. 103. 99 Al-Budayrī, Ḥawādiṯ, p. 193-194. The translation from the origin in Arabic is done by author. 40This description can be considered as a clue to that the recreational culture of Damascus, was appreciated by both genders in the Ottoman period. At the same period in Istanbul, an illustration (fig. 6) shows women enjoying an excursion in the garden of Kağıthane, outside the private courtyards of their houses. 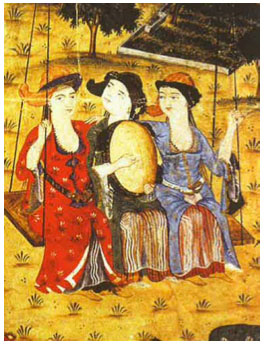 These illustrations, along with al-Budayrī’s description, indicate that women appeared in public gardens alongside men for their leisure activities in this period. 101 Al-Badrī, Nuzha, p. 79. 41The historical records of Islamic gardens in Spain, India, Istanbul and south-Asia give many perspectives of the quadripartite garden style, a well-known Persian landscape legacy called chārbāgh.100 Chārbāgh design refers to a garden divided into four parts by water canals and pedestrian walkways. 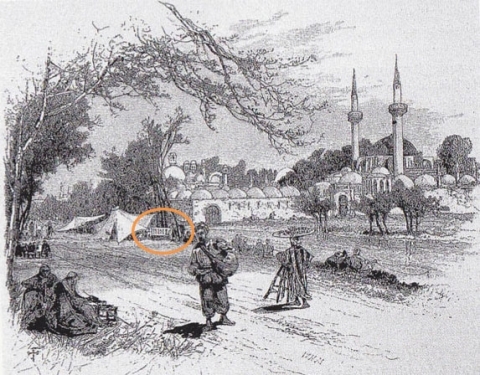 Unfortunately, the visual representation of the Damascene gardens by travellers, as well as the historical descriptions in diaries, poems and texts from the late Mamlūk-Ottoman period, do not provide adequate information on Damascene gardens and the design of surrounding landscapes. However, beyond the Takiyya al-Sulaymāniyya was a famous Mamlūk recreational garden named al-Ǧabha, and overlooking two branches of the Baradā River, the Banyās and al-Qanawāt, that could possibly have had a quadripartite layout. Al-Badrī described al-Ǧabha as a square site, located on the Barada river side, with willows, poplars, and walnut trees, “divided into cultivated areas (maġras) surrounded by water canals from the four directions with fountains, ponds, water-jets, and waterwheels.”101 Yet, this is just one indication of its shape and we do not have much definitive information about the design of the Damascene gardens, which might also have involved natural and spontaneously grown green spaces which were divided between owners. This point, however, requires further research and study. 103 Al-Qaṣāṭilī, Rawḍa, p. 115-116. 104 Pascual 2001, p. 184. 43Regarding the coffee houses, a census which had been done in 1820 mentioned 122 coffeehouses in the city.104 While according to al-Qaṣāṭilī, at the end of the 19th century, there were 110 coffeehouses scattered in different places throughout Damascus. New urban facilities called kāzīnāt emerged at the same time. These kāzīnāt referred to luxurious coffeehouses, located in Sūq al-Ḫayl, al-Marǧa and al-Ṣūfāniyya, where a cup of coffee could cost up to twenty bāra, which was almost three times the price charged at the other coffeehouses in the city.105 The main entertainment coffeehouses for all inhabitants were: al-Manāḫliyya, al-Ǧunayna, al-‘Amāra, al-Ǧāwīš and al-Raṭl, where the price of the coffee was around five bārāt. 107 Baedeker 1893, p. 319. 111 Al-ʿAllāf, Dimašq, p. 35. 47In conclusion, Nuzhat al-anām fī maḥāsin al-Šām and al-Mawākib al-islāmiyya fī-l-mamālik wa-l-maḥāsin al-šāmiyya were both examples of the literary genre prainsing Damascene beauty, and both were considering the intellectual, cultural and aesthetic values of Damascus. The examination and comparison of the two texts shows the role of the Damascene gardens in the urban development, where the city landscape was divided into natural environment and urban gardens. Here, the blossoming of a unique garden culture was manifested in a heightened social commitment towards entertainment, leisure, and intellectual pursuits. This cultural emergence was enhanced by the urban facilities that accompanied gardens, which themselves were established to fulfill social demand. ʻAllāf (al-), Dimašq fī maṭlaʻ al-qarn al-ʿišrīn, ed. ʻAlī Ǧamīl Nuʻaysah, Damascus, Wizārat al-ṯaqāfa wa-al-irshād al-qawmī, 1976. Badrī (al-), Nuzhat al-anām fī maḥāsin al-Šām, ed. Ibrāhīm Ṣāliḥ, Damascus, Dār al-Bašā’ir, 2006. Budayrī (al-), Ḥawādiṯ Dimašq al-yawmiyya 1154-1175h/1741-1762ce. ed. Muḥammad Saʻīd al-Qāsimī & Aḥmad ʻIzzat ʻAbd al-Karīm, Damascus, Dār al-ṭabbāʻ li-l-ṭibāʻa wa-al-Našr wa-l-tawzīʻ, 1997. Yāqūt al-Ḥamawī, Muʻǧam al-buldān, 5 vol., Beirut, Dār Ṣādir, 1977. Ibn Ṭūlūn, al-Qalāʾid al-ǧawharīyya fī tārīḫ al-Ṣāliḥiyya, ed. Muḥammad Aḥmad Duhmān, 2 vol., Damascus, Matbūʿāt maǧmaʿ al-luġa al-ʿarabiyya, 1949-1956. Ibn al-Rāʻī, al-barq al-mutʿalliq fī maḥāsin ǧilliq, ed. Muḥammad Adīb al-Ǧābir, Damascus, Maǧmaʻ al-luġa al-ʻarabiyya bi-Dimašq, 2006. Ibn Ǧumʻa, “al-Bāšāt wa al-quḍāt fī Dimašq” in Wulāt Dimašq fī al-ʻahd al-ʻuthmānī, ed. Ṣalāḥ al-Dīn al-Munaǧǧid, Damascus, 1949. Ibn Kannān, al-Murūǧ al-sundusiyya al-fasīḥa fī talḫīṣ tārīḫ al-Ṣāliḥiyya, ed. Muḥammad Aḥmad Duhmān. Damascus, Maṭbaʻat al-taraqī, 1947. Ibn Kannān, al-Mawākib al-islāmiyya fī-l-mamālik wa-l-maḥāsin al-šāmīyya, ed. Ḥikmat Ismāʻīl. 2 vol., Damascus, Wizārat al-ṯaqāfa, 1992. Ibn Kannān, Yawmīyyāt šāmīyya: al-tārīḫ al-musammā bi-l-ḥawādiṯ al-yawmiyya min tārīḫ aḥad ʻašar wa-alf wa-mi’a, ed. Akram Ḥasan al-ʻUlabī, Damascus, Dār al-Diyā’, 1994. Ibn Manẓūr, Līsān al-ʻarab, 7 vol., Beirut, Dār ṣādir li-l-ṭibāʻa wa-al-našr, 1997. Muḥibbī (al-), Ḫulāṣat al-aṯar fī aʻyān al-qarn al-ḥādī ʻašar, ed. Muḥammad Ḥasan Ismāʻīl, Beirut, Dār al-kutub al-ʻilmiyya, 2006. Murādī (al-), Silk al-durar fī aʻyān al-qarn al-ṯānī ʻašar, ed. Muḥammad ʻAbd al-Qādir Šāhīn, 4 vol. Beirut, Dār al-kutub al-ʻilmiyya, 1997. Nābulusī (al-), Burǧ Bābil wa šadū al-balābil, ed. Aḥmad al-Ǧundī, Damascus, Dār al-ma‘rifa, 1988. Qaṣāṭilī (al-), al-Rawḍa al-ġannāʼ fī Dimašq al-Fayḥāʼ, Beirut, Dār al-rā’id al-ʻarabī, 1982. Qāsimī (al-), Muḥammad Saʻīd, ʻAẓim (al-), Ḫalīl & Qāsimī (al-), Ǧamāl al-Dīn, Qāmūs al-ṣināʻāt al-šāmīyya, ed. Ẓāfir al-Qāsimī, Damascus, Dār Ṭalās, 1988. Saḫāwī (al-), al-Ḍawʾ al-lāmiʻ li-ahl al-qarn al-tāsiʻ, 12 vol., Beirut, Dār al-Ǧīl, 1992. Ziriklī (al-), al-Aʻlām: Qāmūs tarāǧim li-ašar al-riǧāl wa-l-nisā’ min al-ʻarab wa-al-mustaʻribīn wa-al-Mustašriqīn, 8 vol., Beirut, Dār al-ʻilm li-l-malāyīn, 1979. D’Arvieux, Laurent, 1735: Mémoires du Chevalier D’Arvieux: envoyé extraordinaire du Roy à La Porte, Consul d’Alep, d’Alger, de Tripoli, & autres Echelles du Levant, Paris. Baedeker, Karl, 1893: Palestine et Syrie: Manuel du voyageur, 2nd ed., Leipzig. Bartlett, Henry William, Purser, William & Carne, John, 1836: Syria, the Holy Land, Asia Minor & C, 3 vol., London, Paris. Michaud, Joseph François & Poujoulat, Jean Joseph François, 1833: Correspondance d’Orient 1830-1831, Paris. Monconys, Balthasar de, 1665: Journal des voyages de Monsieur de Monconys, Lyon. Akkach, Samer, 2010: “Leisure Gardens, Secular Habits: The Culture of Recreation in Ottoman Damascus”, METU JFA 27, p. 67-80. Akkach, Samer, 2007: “The Wine of Babel: Landscape, Gender and Poetry in Early Modern Damascus”, Literature & Aesthetics 17, p. 107-24. Akkach, Samer, 2007: ‘Abd al-Ghani al-Nabulusi: Islam and the Enlightenment, Oxford, Oneworld. Andrews, Walter, 2008: “Gardens-Real and Imagined-in the Social Ecology of Early Modern Ottoman Culture” in Michel Conan (ed. ), Garden Imagination: Historical Forms and Cultural Roles, Cambridge (Mass. ), Harvard University Press. Blair, Sheila, Bloom, Jonathan and VCU Qatar, 2009: Rivers of Paradise: Water in Islamic Art and Culture, New Haven, Yale University Press. Burns, Ross, 2005: Damascus: A History, London and New York, Routledge. Clark, Emma, 2004: The Art of the Islamic Garden, Ramsbury, Marlborough, Wiltshire, Crowood Press. Conan, Michel (ed. ), 2007: Middle East Garden Traditions: Unity and Diversity: Questions, Methods, and Resources in a Multicultural Perspective, Washington, Dumbarton Oaks Trustees for Harvard University. Degeorge, Gérard, 2004: Damascus, trans. David Radzinowicz. Paris, Flammarion. Bianquis, Thierry, Bosworth, Clifford E., Van Donzel, Emeri & Heinrichs. Wolfhart P., 2010: “Ghūṭa”, E.I.2. Leiden, Brill. Écochard, Michel, Le Cœur, Claude, 1942: Les bains de Damas, monographies architecturales, 2 vol., Beyrouth, Institut français de Damas. Grehan, James, 2007: Everyday Life & Consumer Culture in Eighteenth century Damascus, Seattle, University of Washington Press. Grehan, James, 2006: “Smoking and “Early Modern” Sociability: The Great Tobacco Debate in the Ottoman Middle East (Seventeenth to Eighteenth centuries)”, The American Historical Review 111, p. 1352-1377. Hamadeh, Shirine, 2007: “Public Space and the Garden Culture of Istanbul in the Eighteenth century”, in Virginia H. Aksan & Daniel Goffman (ed. ), The Early Modern Ottomans: Remapping the Empire, Cambridge, Cambridge University Press, p. 277-312. Hamadeh, Shirine, 2008: The City’s Pleasures: Istanbul in the Eighteenth century, Seattle, University of Washington Press. Ḫayr, Ṣaffūḥ, 1982: Madīnat Dimašq: Dirāsa fī ǧuġrāfīyyat al-mudun, Damascus, Wizārat al-ṯaqāfa. Kurd ʻAlī, Muḥammad, 1949: Ġūṭat Dimašq, Damascus, Maṭbūʻāt maǧmaʻ al-luġa al-ʻarabiyya bi-Dimašq. MacDougall, Elisabeth B. & Richard Ettinghausen 1976: The Islamic Garden, Washington, Dumbarton Oaks Trustees for Harvard University. Munaǧǧid, Ṣalāḥ al-Dīn (al-), 1949: Ḫiṭaṭ Dimašq, Beirut, al-Maṭbaʻa al-kaṯūlīkiyya, 1949. Mubaiḍīn, Muhannad, 2009: Ṯaqāfat al-tarfīh wa-l-madīna al-ʻarabiyya fi l-azminat al-ḥadīṯa: Dimašq al-ʿuṯmāniyya namūzaǧa, Beirut, Al-dār al-ʻarabiyya li-l-ʻulūm. Necipoglu, Gülru, 1997: “The Suburban Landscape of Sixteenth-Century Istanbul as a Mirror of Classical Ottoman Garden Culture”, in Attilio Petruccioli (ed. ), In Gardens in the Time of the Great Muslim Empires: Theory and Design, Leiden-New York, Brill. Nu‘aysa, Yūsuf Ǧamīl, 1968: Muǧtamaʻ madīnat Dimašq: fī al-fatra mā Bayn 1186-1256h/1772-1840ce, 2 vol., Damascus, Dār Ṭlās li-l-dirāsa wa al-našr. Pascual, Jean-Paul, 1995-1996: “Café et cafés à Damas: Contribution à la chronologie de leur diffusion au xvie siècle”, Berytus Archaeological Studies 42, p. 141-156. Pascual, Jean-Paul, 2001: “Boutiques, ateliers et corps de métiers à Damas d’après un dénombrement effectué en 1827-28”, in Brigitte Marino (ed. 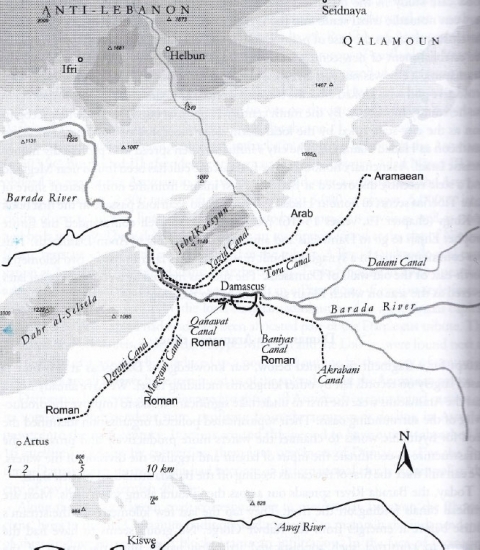 ), Études sur les villes du Proche-Orient, xvie-xixe siècle- Hommage André Raymond, Damascus, Institut français d’études arabes, p. 177-99. Petruccioli, Attilio (ed. ), 1997: Gardens in the Time of the Great Muslim Empires: Theory and Design, Leiden- New York, Brill. Reilly, James A., 1990: “Properties around Damascus in the Nineteenth century”, Arabica 37, p. 91-114. Ruggles, D. Fairchild, 2000: Gardens, Landscape, and Vision in the Palaces of Islamic Spain, Pennsylvania State University Press. Ruggles, D. Fairchild, 2008: Islamic Gardens and Landscapes, Philadelphia, University of Pennsylvania Press. Sāmī, ʻAbd al-Raḥmān Bik, 1981: Al-qawl al-ḥaqq fī Bayrūt wa-Dimašq: Riḥla ilā Sūriyya wa-Lubnān fī awākhir al-qarn al-tāsiʻ ʻašr, Beirut, Dār al-rāʾid al-ʻarabī. Weber, Stefan, 2009: Damascus: Ottoman Modernity and Urban Transformation (1808-1918), Aarhus, Aarhus University Press. 1 I would like to express my gratitude towards Associate Professor Samer Akkach for our fruitful discussions on this topic and for his ongoing support during the preparation of my successfully completed Master’s Thesis (University of Damascus, 2011) “Dimašq: al-Mutanazahāt wa ṯaqāfat al-tanazzuh fi al-qarnayn al-sābi‘ ‘ašr w-al-ṯāmin ‘ašr,” that resulted in the preparation of a map of the most popular Damascene gardens in the 17th-18th centuries. I conducted this research as a post-graduate student in the University of Adelaide, at the Centre for Asian and Middle Eastern Architecture (CAMEA) for a thesis called “Gardens and the Culture of Recreation in the Early Modern Damascus,” under the supervision of A/Prof Samer Akkach and Dr. Katharine Bartsch. I am also immensely grateful for Dr. Katharine Bartsch’s suggestions and comments and her help in improving the English language of the text. I would also like to extend a special thanks to Dr. Jean-Paul Pascual for his comments and continuous assistance on different versions of this paper. 24 For detailed information about the Baradā River, see Ibn al-Rāʻī, Barq, p. 159-169; Ḫayr 1982, p. 83-108; al-Munaǧǧid 1949, p. 23-24; Nu‘aysa 1968, p. 149-185. 26 According to the lexicographer Ibn Manẓūr, the original meaning of Ġūṭa or al-Ġūṭa derives from the root ġawṭ. Al-Ġūṭa is the slope in the ground and it refers to a place with water, trees and plants. Al-Ġūṭa is also a name given to the basātīn (gardens) that surrounded Damascus in all directions, the Ġūṭa Dimašq (Damascene gardens). See Ibn Manẓūr, Līsān, the root ġawṭ; Yāqūt al-Ḥamawī, Muʿǧam, IV, p. 219. 29 Waterwheels were frequently used for irrigation, and were linked to palaces, houses, religious schools and other structures in the city. For information about the locations of waterwheels in Damascus, see Ibn Kannān, Mawākib, I, p. 259. 31 Sīrān, in Damascene dialect comes from the root sayr which means stroll and walk, see Ibn Manẓūr, Līsān, the root sayr. 32 Al-Badrī, Nuzha, p. 309-310. The editor Ibrāhīm Ṣāliḥ mentioned that Suġd Samarqand, Šiʻb Bawwān and Nahr al-Ubulla are three rivers surrounded by gardens, water and palaces. The translation is done from the origin in Arabic by the author. 33 The British traveler and artist William Henry Bartlett, visited Damascus in 1840 and represented the city’s topography in many famous drawings. See Bartlett, Purser & Carne 1836. Unlike Istanbul, the illustrations and accounts of Damascus on the subject of gardens and landscapes in late the Mamluk-Ottoman period, did not trigger to the amount of prints and accounts that emerged about gardens in Istanbul. Many paintings are available about urban centers and landscapes of Istanbul, including those made by Thomas Allom, Robert Walsh, and W.H Bartlett, and other illustrations from Enderunlu Fazil in the Hûbânnâme ve Zenânnâme book. For information on recreational gardens in Istanbul, see Hamadeh 2007; Hamadeh 2008; Necipoglu 1997; Andrews 2008. 37 There are numerous amounts of the Damascene beauties which are “difficult to count”, al-Badrī said. See also al-Nābulusī, Burǧ, p. 103. 40 Al-Badrī, Nuzha, 85. The translation is done from the original text in Arabic by author Samer Akkach. See Akkach 2007, 116. 43 Ibn Kannān, Mawākib, I, p. 289, footnote n° 7. See also, Aḥmad Duhmān introduction in Ibn Ṭūlūn, Qalā’id, p. 11. 45 The term tuḫūt is still used in other cities in Syria such as Ḥamā. According to a Ḥamā citizen it refers to a bench or a seat that used to be in the gardens. 48 Ḥusayn Afandī Ibn Muṣṭafā Ibn Ḥasan, known as Ibn Qarnaq al-Dimašqī (d. 1090/1679), was famous for his skills in enchantment, sorcery, magic, witchery and other occult sciences. He became a wealthy man, who had many properties and built his palace and hall (qāʿa) in al-Ṣāliḥiyya. He held high official financial positions in the Province and in the managing of many important waqf-s such as al-Salīmiyya, al-Sulaymāniyya, al-Ḥaramayn al-Miṣriyyin and Umayyad Mosque. He travelled twenty times to al-Rūm. He was chosen by the pilgrims’ elites (a‘yān al-ḥuǧǧāǧ) to become the amīr al-ḥaǧǧ (the military official, in charge of conducting the pilgrim caravan) after the death of the existing official during this pilgrimage. He travelled one more time to al-Rūm and took Baalbek tax-farming and had many slaves, female and male, and even children. See al-Muḥibbī, Ḫulāṣat, II, p. 118-120. 51 Unfortunately Ibn Kannān did not state the reason for the destruction of the maqāʻid. In the same year, in 1080/1669-1670, Ibn Ǧumʻa al-Maqqār –a historian of the late 17th to early 18th century—stated that Damascus was devastated by a severe plague that resulted in huge damages (ḍarar) and led to “a thousand funerals in one day.” However, if there is any relation between the two events requires more investigation. See Ibn Ǧumʻa, Bāšāt, p. 40. 52 Ibn Kannān, Mawākib, I, p. 291-307. At the beginning of the 17th century around 1011/1602, most of the gardens in al-Mazza and al-Rabwa, were put under the control of Kīwān Ibn ʻAbd Allāh. He was one of the elite soldiers of the Damascene army (kubarā’ aǧnād al-Šām), who seized these gardens from their owners either voluntarily or by force, by cheating and colluding with the deputies court, who were paid by Kīwān. See al-Muḥibbī, Ḫulāṣat, III, p. 299-301. As noticed, al-Mazza, around 1011/1602 was under Kīwan's control, but it mentioned by Ibn Kannān that it was a village divided among many owners in 1080/1669. Yet, the question is still open about the property of al-Mazza. 53 Ibn Manẓūr, Līsān, the root qaṣab. Ibn Manẓūr mentioned many definitions of qaṣaba: a recently excavated well, or a qaṣaba of a location refers to that location’s core, or a qaṣaba means a village etc. Here, the interpretation of qaṣaba as a small village is viable in the context. 54 In Arabic dictionaries the word ḥāna pl. ḥānūt means a place for drinking wine or a winery. See Ibn Manẓūr, Līsān, the root ḥnt. However, the meaning of ḥanūt in this context is a shop or boutique, because this meaning is used in the court documentation of the same period. 55 Aṭbāq or ṭibāq according to Ibn Manẓūr, means layers situated above each other. See Ibn Manẓūr, Līsān, the root ṭbq. 58 De Monconys 1665, p. 345. “Ils sont tout couverts, avec des vitres au milieu ; il y a une belle fontaine à plusieurs jets qui tombent dans un grand bassin carré ; tous les bancs sont couverts de tapis, et il y a des théâtres où des chantres et joueurs d’instruments divertissent les buveurs.” The translation is done from the origin in French by author David Radzinowicz. See Degeorge 2004, p. 176. 60 Sāḥat Taḥt al-Qalʿa–the square under the citadel- was famous for its various types of markets: fur, cloaks and cloth market, copper, sieves and glass market, fruits, vegetables, butchers and nuts market as well as carpenters and tailors shops. See al-Badrī, Nuzha, p. 66-67; Ibn Kannān, Mawākib, I, p. 247. 62 See al-Ǧabha: al-Badrī, Nuzha, p. 79; Ibn Kannān, Mawākib, I, p. 222-223. See also Qaṭya garden in Ibn Kannān, Mawākib, I, p. 229-230. 64 Al-Badrī, Nuzha, p. 79. There is scant information about the building materials used for the structures in the gardens. Perhaps we could assume that the canteens were constructed using light materials such as thatch. These light structures were probably temporary, and used to build coffeehouses in spring that were demolished in autumn and winter when the garden was returned to agricultural use. Alternatively, it could be interpreted that the owner of the garden rented the place to the maqāsifī in the spring and summer when the recreational activities (tanazzuh/sīrān) took place. These are unanswered questions that require further research. 68 It could be assumed that the famous gardens equipped with all facilities were intended for rich people who were able to afford the expenses. However, we do not have more information to enforce that assumption and this require further research. 70 Ibn Kannān, Mawākib, I, p. 247. Ḥikmat Ismāʻīl in the footnote identified Muḥammād Bāšā Ibn Bayram, an Ottoman vizier who ruled Damascus twice, from 1114/1702 to 1115/1703 and from 1117/1705 to 1118/1706. 71 Al-Badrī, Nuzha, p. 82-83. Al-Nayrabayn was divided into al-Nayrab al-a‘lā—situated between Yazīd and Ṯawrā Rivers, and al-Nayrab al-adnā -located between Ṯawrā and Baradā Rivers. 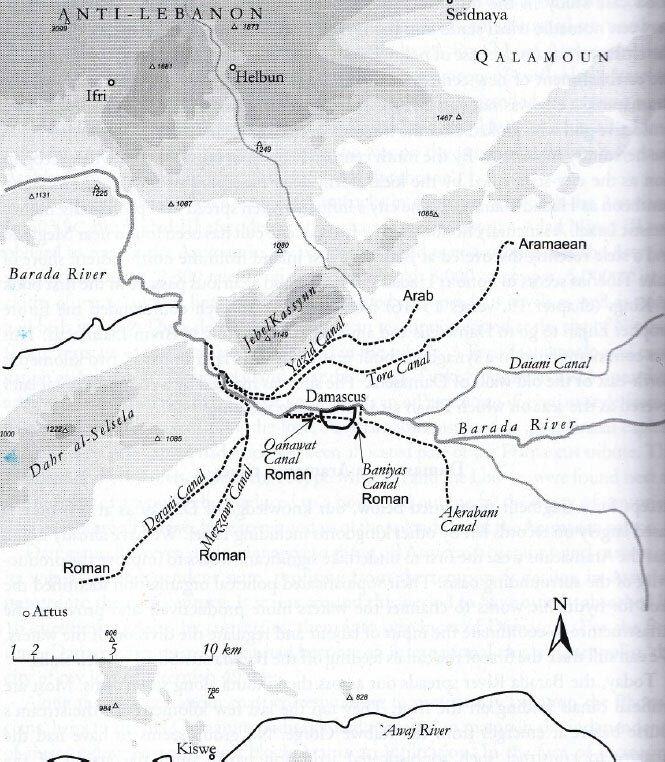 73 The location of al-Bahnasiyya was in the east of al-Rabwā and neighbouring al-Dahša and the bridge (ǧisr) Ibn Šawwāš still exists near to the mill of Kīwān land (see the attached map). 74 Al-Badrī, Nuzha, p. 81-82; Ibn Kannān, Mawākib, I, p. 230-231; See also Ibn Manẓūr, Līsān, the root qaṣar. 80 Ibn Kannān, Mawākib, I, p. 270. Al-Zuhrabiyya location has the al-Barāmka cemetery for elite’ (a‘yān) tombs, such as Ibn Taymiyya, and used to be a place of Turk residence. 82 Ḥusayn Bāšā (d. 1094/1682), a famous vizier in Damascus, built his palace in al-Ḫātūniyya, in al-Šaraf. The location of the palace was filled with all kinds of plants and trees, including both native Damascene flora and imported varieties. See al-Muḥibbī, Ḫulāṣat, II, p. 124. 86 For the recreational gathering in the days of roses in spring, see al-Ṣālihī, Yawmiyyāt, p. 301, 463, 478. 88 For information about the Damascene beauties, public recreation, secularity and fame derived from ʻAbd al-Ġanī anthology, see Akkach 2007. 89 Al-Nābulusī, Burǧ, 21. The translation from the original text in Arabic was done by author Samer Akkach. See Akkach 2007, p. 111-112. For information on different kinds of leisure and entertainment activities in Damascus during the Ottoman period, see Mubaiḍīn 2009. See also a recent publication about recreational Damascene gardens: Akkach 2010. 91 See the architectural description of the palace in: Law-Court Records, Damascus, vol. 60, document no818, case dated to 1138/1725. 95 Ibn Kannān’s diary indicates that mostof these elite gatherings were held on Saturdays and Tuesdays. 100 For information on the Islamic garden, see MacDougall & Ettinghausen 1976; Ruggles 2000; Clark 2004; Ruggles 2008; Blair 2009. 105 Al-Qaṣāṭilī, Rawḍa, p. 109. 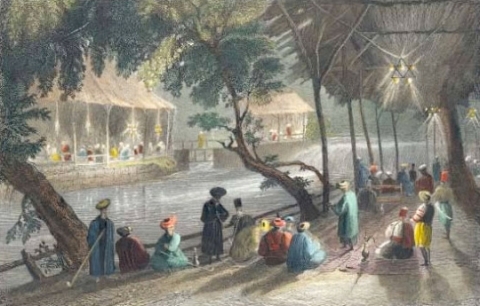 In 1890, ʿAbd al-Raḥmān Bik Sāmī mentioned 122 coffeehouses which varied between large and small sizes, and hight and low prices, see Sāmī, Qawl, p. 93. 108 For information about which days and which places that were used for recreational practices, see al-ʿAllāf, Dimašq, p. 171. 109 Al-ʿAllāf, Dimašq, p. 208-210. For information about the games that were famous among public and young people see the previous source page 212-217. Georgina Hafteh, « The Garden Culture of Damascus: New Observations Based on the Accounts of ʻAbd Allāh al-Badrī (d. 894/1489) and Ibn Kannān al-Ṣāliḥī (d. 1135/1740) », Bulletin d’études orientales, Tome LXI | 2012, 297-325.